Stornoway’s principal business is the operation of its 100% owned Renard Mine. Now in full production following the completion of a C$946m project financing transaction in July 2014, the first ore was delivered to the plant in July 2016. Commercial production was achieved on January 1, 2017. The mine will produce an average of 1.8 million carats per year over an initial 14-year mine life, representing approximately 1% of global supply. The potential exists to extend the mine life through the development of the project’s substantial Mineral Resource upside. The Renard Diamond Mine is located near the Otish Mountains in the James Bay region of north-central Québec, approximately 800 km north of Montréal and approximately 400 km north of Chibougamau. 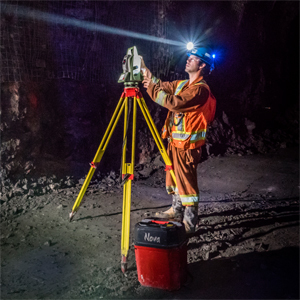 Discovered in 2001, the Mine can be accessed by road from Chibougamau via the Route 167 extension/Renard Mine Road, constructed by Stornoway and the Province of Québec under the auspices of Québec’s Plan Nord. Air access is by way of Renard’s Clarence and Abel Swallow Airport, located 8 km south of the mine site. Renard was built under the terms of the Mecheshoo Agreement, signed in March 2012 between Stornoway, the Grand Council of the Crees (Eeyou Itschee), and the Cree Nation of Mistissini, as well as Partnership Agreements signed in July 2012 between Stornoway and the communities of Chapais and Chibougamau. Employing more than 400 people during its construction and more than 600 now during operations, the Renard Diamond Mine has created many jobs for the local communities. 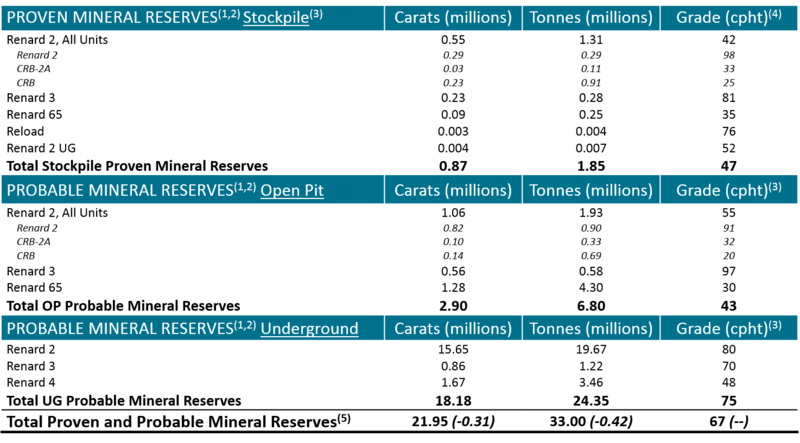 1Reserve categories follow the CIM Standards for Mineral Resources and Mineral Reserves. 2Totals may not add due to rounding. 4Carats per hundred tonnes. Estimated at a +1 DTC sieve size cut-off. 1Resource categories were completed in accordance with the "CIM Definition Standards on Mineral Resources and Reserves". Mineral resources that are not mineral reserves do not have demonstrated economic viability. 3Carats per hundred tonnes. Estimated at a +1 DTC sieve size cut-off. 1Target for Further Exploration: represents potential upside that can be reasonably assumed given the nature and grade of material within the current 2015 Mineral Resource. The Renard 2 shape has been projected 250m below the deepest kimberlite intersection at 1,000m depth. 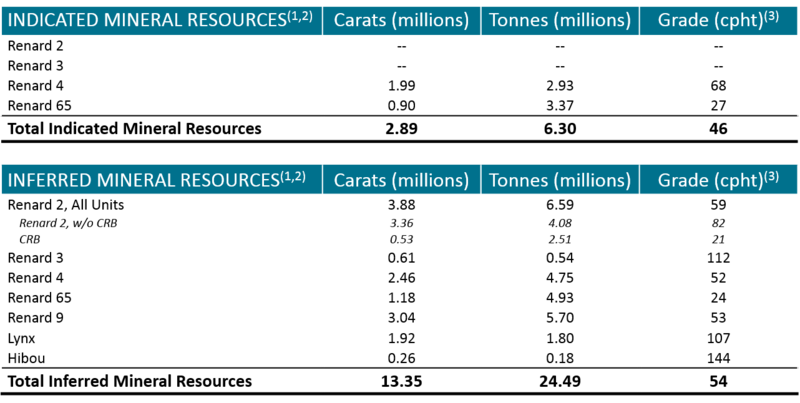 Tonnage and grade ranges are not directly applicable to potential total carats.The potential quantity and grade of any Exploration Target is conceptual in nature, there has been insufficient information to define a mineral resource, and it is uncertain if further exploration will result in the target being delineated as a mineral resource. 2Carats per hundred tonnes. Potential at a +1 DTC sieve size cut-off.